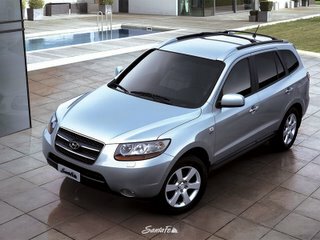 Over the past couple weeks I have searched the internet for the new upcomming 2007 Hyundai Santa Fe. 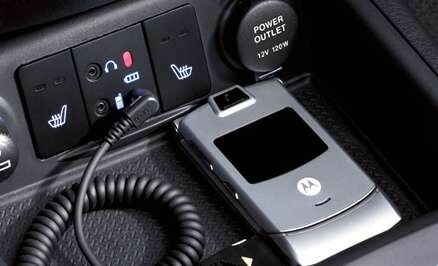 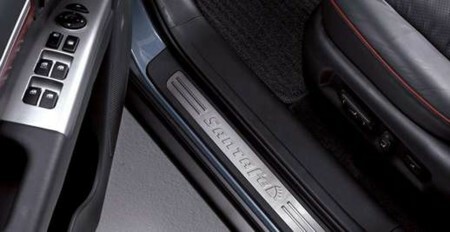 Below is what I have found. 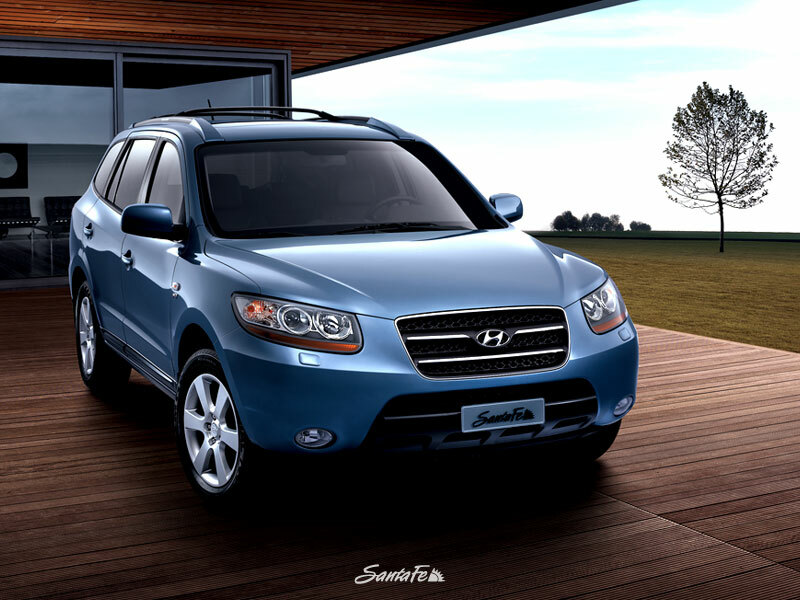 We at Gary Rome Hyundai hope you are as excited as we are with the new 2007 Hyundai Santa Fe's design. These photos capture a prototype Santa Fe without any front-bumper disguise, thus giving us a clear view of the SUV’s bold new looks. With the new Hyundai Tucson filling the role of compact SUV in the model lineup, Hyundai is now free to grow the Santa Fe in size and move it up to compete with larger SUV’s like the Nissan Murano and Toyota Highlander. The increased size will allow the Santa Fe to have a third row of seats for the first time. The new Santa Fe will be built on a platform that is shared with the new Hyundai Sonata sedan, and the Santa Fe will also be built at Hyundai’s new plant in Montgomery, Alabama. Styling is all new and ditches the quirky looks of the current Santa Fe in favor of a modern bold look with a large forward-sloping grille. 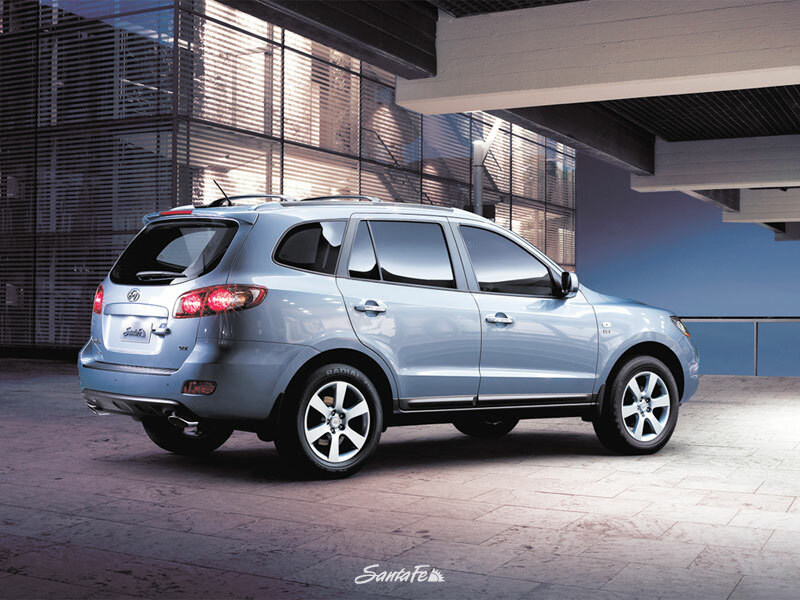 The rounded shape of the front-end gives the new Santa Fe a unique design by eliminating the typical protruding bumper used on every other SUV. 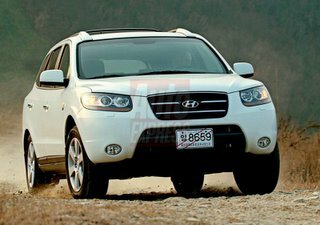 The addition of the Hyundai Tucson compact SUV to the company's lineup has given Korea's top automaker the opportunity to expand its flagship SUV. 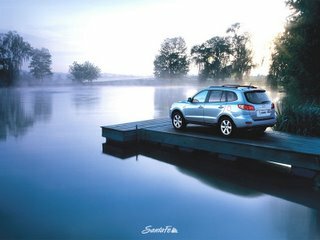 As you can see from these photos, the 2007 Hyundai Santa Fe will be considerably larger than the current 2005 Santa Fe and will be positioned within the brand to compete with more upscale vehicles. 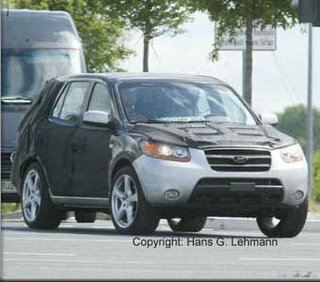 Also evident from our spy shots is the change in design direction for this upcoming version of the Hyundai Santa Fe, due out toward the second half of 2006. 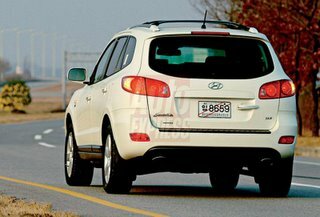 The company has more or less replaced the 2005 Hyundai Santa Fe's awkward lines with a more sculpted and distinctive look. An increase in its overall length will allow the 2007 Santa Fe to contain, for the first time, a third row of seats, moving it more or less into the same class as larger Japanese SUVs such as the Honda Pilot and Toyota Highlander. 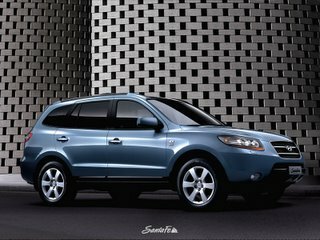 The 2007 Santa Fe's interior should be more refined than the current edition in order to match the exterior's move toward a less quirky appearance. 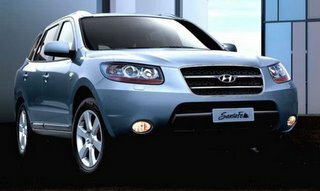 Hyundai had more room to work with the Santa Fe this time around as the Tucson has now assumed the role of its entry-level SUV. Hyundai was able to increase the 2007 Santa Fe's size by moving the vehicle's construction to the same platform that was used to build the brand-new 2006 Sonata sedan. 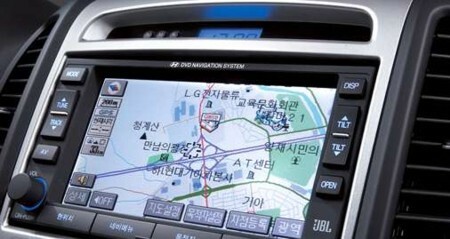 And like the Sonata, the 2007 Santa Fe will be built at the company's recently opened facility in Montgomery, Alabama. Don't expect any big surprises under the hood of the 2007 Hyundai Santa Fe. 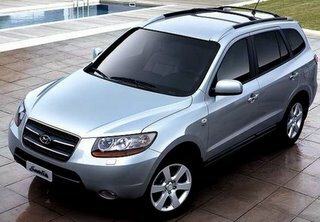 In fact, it's likely that the vehicle will carry over the 2005 Santa Fe's 3.5-liter V6, perhaps with a little bit more in the way of horsepower, though. 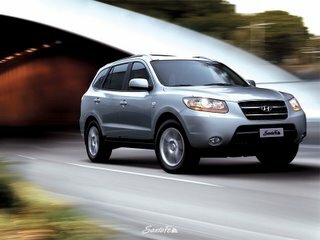 Look for the official debut of the 2007 Hyundai Santa Fe at the 2006 North American International Auto Show in Detroit. 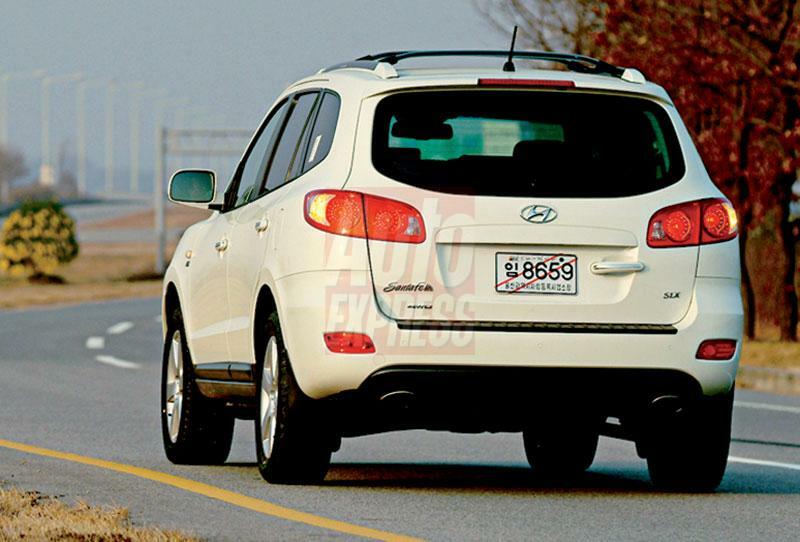 Spy Shots: ’07 Hyundai Santa Fe Coming to America, the long way. 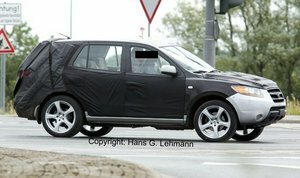 by Hans Lehmann/Hidden Image (2005-07-11) thecarconnection.com Hyundai has been on a new-product blitz, bringing to market one new vehicle after another. So far Hyundai has introduced the Tucson and the Sonata, and has put out official information on the Azera. 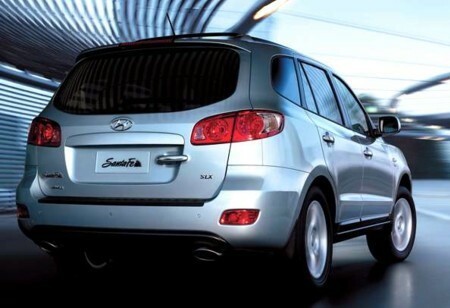 Still to come is an all-new Hyundai Santa Fe sport-utility vehicle. 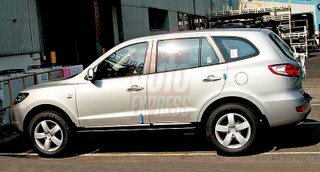 These photos capture a prototype Santa Fe without any front-bumper disguise, thus giving us a clear view of the SUV's new looks. 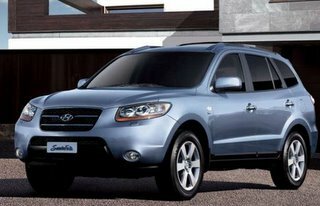 With the new Hyundai Tucson filling the role of compact SUV in the model lineup, Hyundai is now free to grow a larger Santa Fe and move it up a size class to compete with larger SUVs like the Nissan Murano and Toyota Highlander. The increased size will allow the Santa Fe to have a third row of seats for the first time. 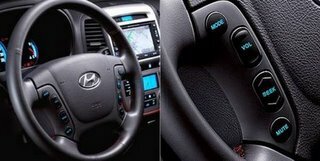 The new Santa Fe will be built on a platform that is shared with the new Hyundai Sonata sedan, and the Santa Fe will also be built in Hyundai's new plant in Montgomery, Alabama. 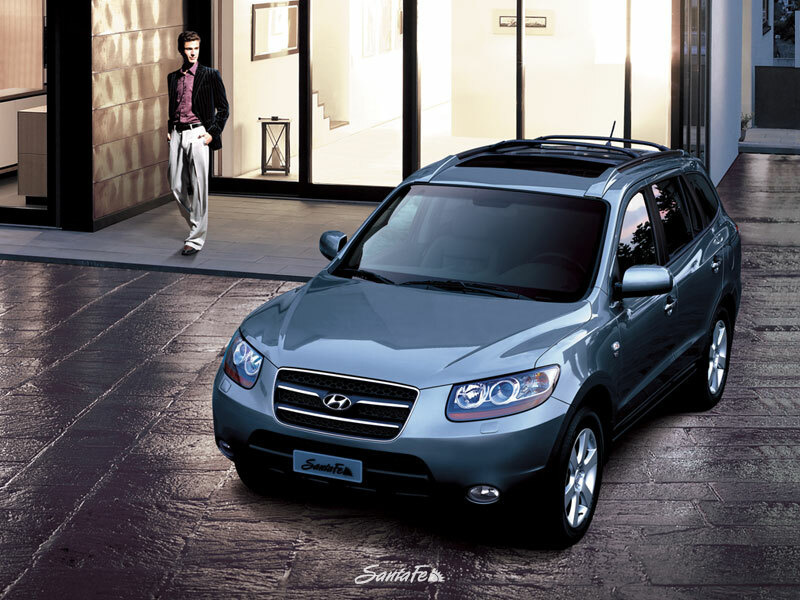 Styling is fresh and ditches the voluptuous looks of the current Santa Fe in favor of a look with a large, forward-sloping grille. 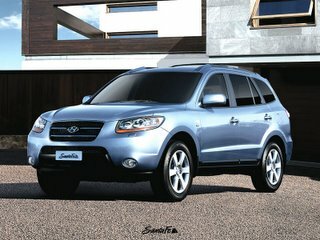 The rounded shape of the front end gives the new Santa Fe a unique design by eliminating the typical protruding bumper used on every other SUV. 2007 Hyundai Santa Fe launches in Korea Posted Nov 22nd 2005 3:30PM by Stuart Waterman Filed under: SUVs autoblog.com Little information other than what we can glean from the pictures, but what we can see shows that the new Santa Fe is a huge improvement over the current version. 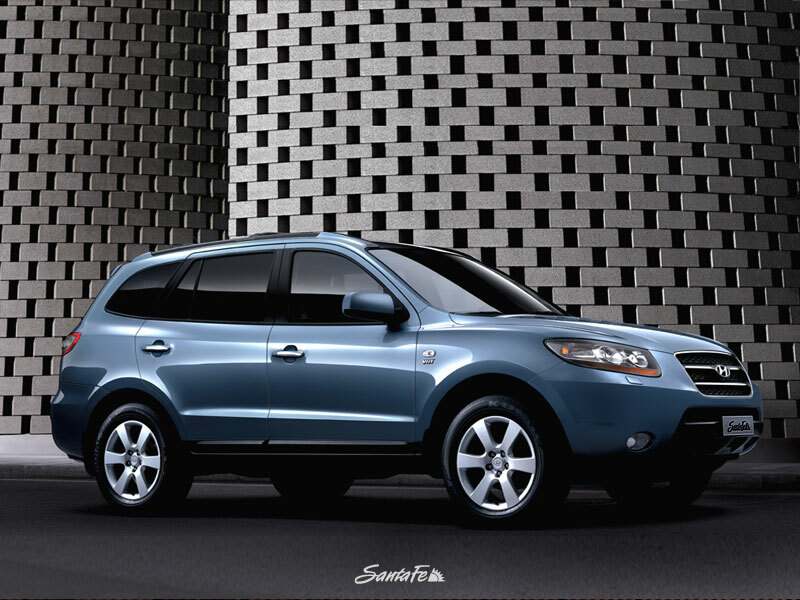 Hyundai's Santa Fe-dedicated website is here (warning - lots of Flash). Autoblog reader Source1 reports that a Hyundai dealer told him that we can expect two engines, a 3.3-liter putting out 240-250 hp, and a 3.8-liter with 275-285 hp. 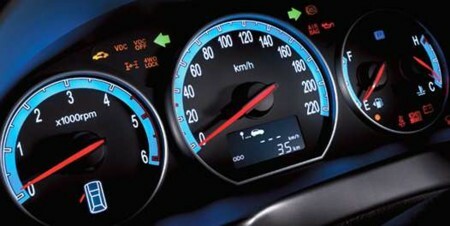 Much more after the jump! 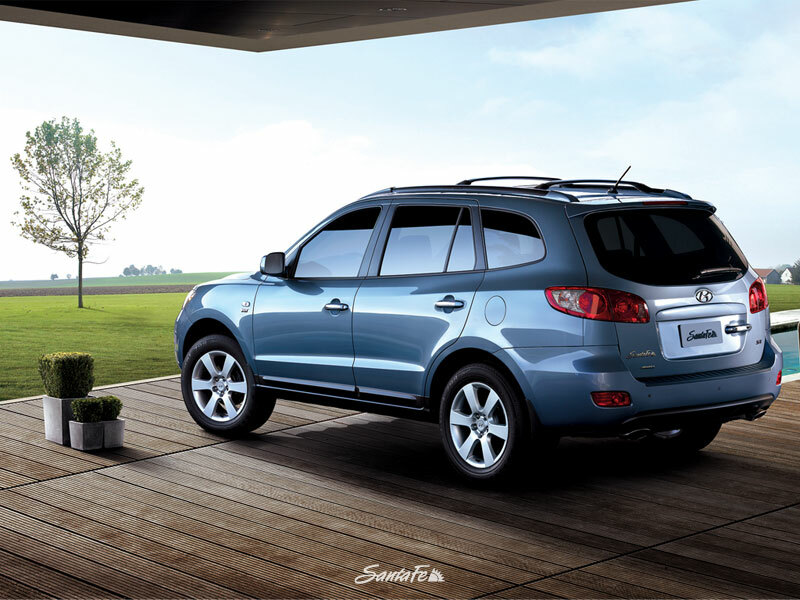 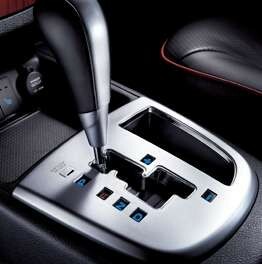 Pictures from the Hyundai Official Santa Fe webstite here.